Teammates celebrated Mark Buehrle's perfect game on July 23, 2009 at around 3:10 PM CT.
Mark Buehrle of the Chicago White Sox pitched a perfect game against the Tampa Bay Rays by retiring all 9 batters he faced 3 times each on Thursday, July 23, 2009. This event took place in U.S. Cellular Field in Chicago, Illinois in front of 28,036 fans in attendance. This game took 2:03 from 1:07 PM CT to 3:10 PM CT. It was the 18th perfect game and 263rd no-hitter in MLB history, 2nd perfect game and 17th no-hitter in White Sox history. The last perfect game in MLB history was on May 18, 2004 when Randy Johnson of the Arizona Diamondbacks pitched a perfect game against the Atlanta Braves at Turner Field. The last time a White Sox pitcher threw a perfect game was on April 30, 1922 when Charlie Robertson pitched it against the Detroit Tigers at Navin Field (later known as Tiger Stadium); that was the 5th perfect game in MLB history. Buehrle also logged his second career no-hitter; the first was against the Texas Rangers on April 18, 2007. He became the first pitcher to throw multiple no-hitters since Johnson. Buehrle did this in the midst of setting a Major League record by retiring 45 consecutive batters over three games. The umpire, Eric Cooper, who stood behind the plate for this perfect game was the same home plate umpire when Buehrle threw his first career no-hitter. Ramón Castro was the catcher. At the time, the Rays were tied for their second-highest on-base percentage (.343) of any team, so they were one of the least likely to allow a perfect game. Buehrle's perfect game is the first of three perfect games and the first of four no-hitters allowed by Rays in less than three years — the second was delivered by Dallas Braden of the Oakland Athletics on May 9, 2010 (Mother's Day) — the third being delivered by Edwin Jackson of the Arizona Diamondbacks on June 25, 2010 — and the fourth being delivered by Félix Hernández on August 15, 2012. Mark Buehrle was a 38th round pick and 1139th overall in 1998 draft pick by the White Sox. Buehrle made his major league debut on July 16, 2000, pitching one inning of relief while allowing a run to Milwaukee Brewers. Then he made his first starting appearance on July 19, pitching seven innings while allowing six hits and two runs to Minnesota Twins. On April 18, 2007 against the Texas Rangers at U.S. Cellular Field, Mark Buehrle threw his first career no-hitter. In that game, he threw 106 pitches and faced 27 batters while allowing just one walk. After allowing a walk to Sammy Sosa in the fifth inning and one out after a 3–1 pitch, and he was promptly picked off from first base while facing the next batter. This was the 16th no-hitter in White Sox history, the first one since August 11, 1991 when Wilson Alvarez threw one at Memorial Stadium against the Baltimore Orioles and first at home since September 10, 1967 when Joel Horlen threw one against the Detroit Tigers. Mark Buehrle was the 2009 Opening Day starter, which he took the victory as the Sox beat the Kansas City 4–2. Buehrle won five straight decisions to start the 2009 season. He finished 9–3 before the All-Star break and he was voted to the All-Star Game in Busch Stadium in St. Louis near his hometown, where he pitched a perfect third. After completing his perfect game, Buehrle had an 11–3 pitching record with a 3.28 ERA. Buehrle struggled in the gaames following the perfect game and he did not get another win until September 7 against the Boston Red Sox. On September 30 in the second game of the doubleheader, Buehrle pitched his final game of the season at Cleveland and he took the victory when the Sox shutout Cleveland 1–0. After his perfecto till the end of his 2009 campaign, he posted a 2–7 record with a 4.78 ERA and he finished the season 13–10 with a 3.84 ERA. He became the only active player to pitch for least 200 innings for nine consecutive seasons after his debut in 2000. Buehrle was named the 2010 Opening Day starter, which became a franchise-record eighth time. In that game, he pitched 7 innings and allowed no earned runs. Incredibly, in the fifth inning, he made a spectacular play facing Lou Marson of the Cleveland Indians. Marson hit a ball which bounced off Buehrhle's foot, and he managed to pick it up with his glove and immediately throw it backwards between his legs without looking back and 1st baseman Paul Konerko caught the ball with his bare hand for the second out of the inning. This is the #1 play of the season as no other plays beat Buehrle for the remaining six months of the 2010 regular season. In the show Baseball Tonight, the "Buehrle-Meter" is used to estimate the performance of the #1 Web Gems from 1–10 where 10 is just as spectacular as Mark Buehrle's spectacular play on April 5, 2010. In the bottom of the second inning with two outs and a 3–1 pitch, Josh Fields hit a grand slam off of Scott Kazmir, giving the White Sox a 4–0 lead. In the bottom of the fifth inning, Scott Podsednik hit a lead-off double. The next batter, Alexei Ramírez, scored Podsednik from second with a double of his own, making it a 5–0 White Sox lead. Two of the Rays batters hit a foul ball very close to the fair territory down the left field line. Five of the Rays hitters had a full (3-2) count. In the top of the ninth inning, the Rays' leadoff hitter, Gabe Kapler, hit a deep fly ball to left field-center field, where DeWayne Wise made a spectacular catch, taking a home run away from Kapler and saving the perfect game for Buehrle. Wise was a defensive replacement prior to the ninth inning. The next batter, Michel Hernández, struck out swinging on a two-seam fastball with a full (3–2) count. The final batter, Jason Bartlett, hit a ground ball to shortstop Alexei Ramírez, who threw it to first baseman Josh Fields (Paul Konerko was the designated hitter for the day) to finish off the history-making moment at 3:10 PM CT.
As Buehrle exited the field after the eighth inning, White Sox broadcaster Ken Harrelson exclaimed, "Call your sons! Call your daughters! Call your friends! Call your neighbors! Mark Buehrle has a perfect game going into the ninth!" As the final ground ball of the game rolled towards White Sox shortstop Alexei Ramírez, Harrelson called out: "Alexei?!" As Ramirez completed the throw to first baseman Josh Fields, Harrelson shouted, "Yes! Yes! Yes! Yes! Yes! History!" Though many did not like Harrelson's verbosity and obvious hometown boosterism at the concluding moment of the game, others felt the outburst of emotion captured exactly what they were feeling as the perfect game was sealed. With the final out, the White Sox players ran onto the field, hugging each other. President Barack Obama, an ardent White Sox supporter, called Buehrle to congratulate him on his perfect game. Then his wife Jamie and her baby daughter Brooklyn came to the U.S. Cellular Field from their home in suburban Chicago to congratulate Mark. On July 29, 2009, Mark threw 5 2⁄3 perfect innings. By retiring former teammate Joe Crede, Buehrle set the new record for consecutive batters retired, beating Jim Barr (who had retired 41 consecutive batters over the course of two complete-game wins in 1971, from the third inning of one to the seventh inning of the next) and teammate Bobby Jenks (who had tied Barr's mark over 14 relief appearances in 2007). Buehrle would then go on to retire the next three batters, before walking Minnesota Twin Alexi Casilla with two outs in the sixth inning, thus foiling Buehrle's chance of becoming the first pitcher to ever throw consecutive perfect games (or even a second career perfect game). Denard Span followed Casilla with a single, thus foiling Buerhle's chance of becoming the second pitcher to throw consecutive no-hitters (the first being Johnny Vander Meer in 1938); in fact, Buerhle allowed 5 runs in 6 1⁄3 innings and took the loss on July 29. Combined with the last out of one appearance, his perfect game, and the 5 2/3 innings worth of perfection, Mark set the new record at 45 consecutive batters retired. This mark was broken by Yusmeiro Petit with 46 over 8 appearances in 2014. On July 29, 2009 Illinois Governor Pat Quinn declared July 30 "Mark Buehrle Day". On August 4 before the game against the Los Angeles Angels, the White Sox held a special ceremony and provided "perfect game" and "MLB Record-Setting" giveaways for fans attending the Sox-Angels series. This series against the Angels was called "The Buehrle Appreciation Series". The left field wall where Wise made his ninth-inning home run-robbing catch is marked with the text, "The Catch". ^ a b c d David Just (2009-07-23). "Buehrle enters record books with perfecto". ^ a b Jon Krawczynski (2009-07-28). "Mark Buehrle Sets Perfect Innings Record". The Huffington Post. Retrieved 2010-07-18. ^ "2009 American League Season Summary". ^ Ian Ritz (2010-05-09). "Dallas Braden's Perfect Game". The Epoch Times. Retrieved 2010-07-21. ^ Marc Lancaster (2010-06-25). "Edwin Jackson No-Hits Tampa Bay Rays Despite Eight Walks". MLB Fanhouse. Retrieved 2010-07-21. ^ "38th Round of the 1998 MLB June Amateur Draft". ^ "Mark Buehrle 2000 Pitching Gamelogs". 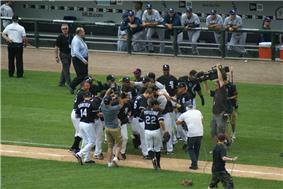 ^ "White Sox Pitcher Mark Buehrle Tosses No-Hitter". NewsMax.com. 2007-04-19. Retrieved 2010-08-19. ^ Scott Merkin (2007-04-19). "Buehrle an unlikely candidate for no-no". ^ "Buehrle gets first win since perfect game as Chicago tops Boston". USA Today. 2009-09-08. Retrieved 2010-08-14. ^ a b "White Sox Beat Indians 1-0 for Doubleheader Split". Black Christian News. 2009-09-30. Retrieved 2010-08-15. ^ "Mark Buehrle 2009 Pitching Gamelogs". ^ Mark Newman (2010-04-05). "Stage set for full slate of openers". ^ Jon Heyman (2010-04-06). "Superb Buehrle steals Opening Day spotlight with fielding gem". Sports Illustrated. Retrieved 2010-08-15. ^ "Best of Baseball Tonight Web Gem Awards — Monday, Oct 25, 2010". mReplay Livedash TV Transcript. 2010-10-25. Retrieved 2010-10-30. ^ "Boxscore: Tampa Bay vs. Chicago White Sox - July 23, 2009". ^ "July 23, 2009 Tampa Bay Rays at Chicago White Sox Box Score and Play by Play". ^ "Buehrle seals perfect game". ^ Daniel Berkowitz (2009-07-24). "Hawk Harrelson’s Terrible Buehrle Call". MLB BABBLE. Retrieved 2010-07-20. ^ 'Duk (2009-07-23). "Ten reasons we're going nuts over Mark Buehrle's perfect game". Yahoo! Sports. Retrieved 2010-07-18. ^ Jon Greenberg (2009-07-23). "Just like you, but perfect". ESPN Chicago. Retrieved 2010-07-23. ^ Schoenfield, David (August 28, 2014). "Yusmeiro Petit's awesome MLB record". ESPN MLB. Retrieved August 28, 2014. ^ BJ Lutz (2009-07-30). "Happy Mark Buehrle Day! ".